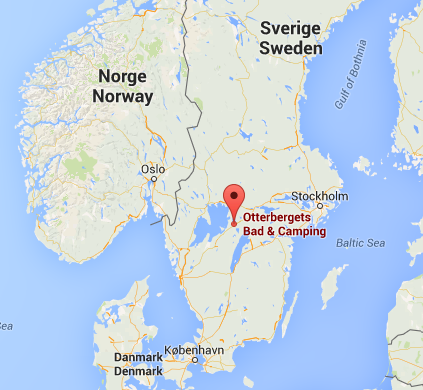 Approximately 13 km from the camping site you will find the nature reserve of Högsåsen. For hikes in this beautiful reserve you can choose from dozens of trails, distances varying from 1 to 22 km. More information: www.hogsasenitiveden.se. Kinnekulle is a table mountain which rises above fields, farmlands and the blue water on the east shore of the Vännern lake, near Götene. The highest point is 306 metres above sea level. The base of the Kinnekulleplateau is home to numerous fossils, various rare plants and flourishing flowers. Especially in Spring, a visit is highly recommended. 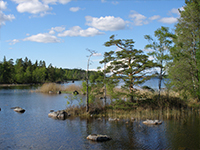 The Vännern lake is the third largest lake of Europe. It has a length of 140 km and it is 73 km wide. You can enjoy this vast lake in various ways, for instance by making a boat trip from Otterbäcken to Störon, Sjötorp or Mariestad on board of the 100 year old M/S Marianne. To the south east of the camping site you will find the national park Tiveden with its enchanting virgin forest. It can be described as a wild forest landscape with remnants of the last Ice Age, like giant boulders, beautiful fissure valleys, plateaus and many lakes. The park offers many opportunities for hiking of varying distances. For more information: www.naturvardsverket.se. Centrally located in Gullspång you will find the Salmon stairs, built in 2004 to increase the salmon population. 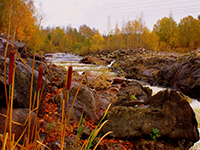 On beautiful autumn days you can see the salmon jump here. Near Örebro, close to the village of Garphyttan, liesTysslingen, a lake where you can see many different kinds of birds. South of the village you will find the national park Garphyttan on the foot of the dense forest Kilsbergen. The park, made up of woods, small fields, gardens, hills and piles of stones is situated in an old cultivated region. In June the variety of flowers is most impressive. Straight through Götaland runs the Göta kanal. The canal was built in the 19th century, to provide a trading route between Stockholm and Göteborg, it has a length of 190 km. A boat trip on the Göta kanal offers fantastic views of the landscape and is highly recommended. 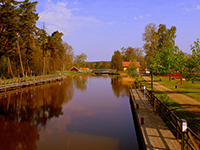 Between Sjötorp en Karlsborg you will encounter a total of 21 locks. You can board in Sjötorp, Töreboda or Karlsborg. For more information:www.vikenrederi.se.